Pumps are hydraulic machines that convert mechanical energy to hydraulic energy. The hydraulic energy is in form of pressure energy. Centrifugal pumps convert mechanical to pressure energy by centrifugal action. Centrifugal pumps work on the principle of forced vortex flow which means that when a certain mass of liquid is rotated in by an external torque, rise in pressure head of rotating liquid takes place. Rise in pressure head is directly proportional to the square of tangential velocity of the liquid at that point (pressure head directly proportional to square of velocity ie, it is directly proportional to square of radius). 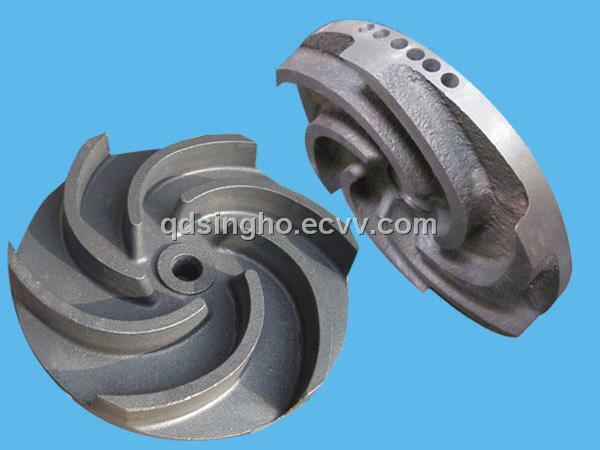 Thus at outlet of the impeller, where radius is more, the rise in pressure head will be more and the liquid will be discharged at the outlet with a high pressure head. Due to this high pressure head, liquid will be lifted to a high level. It is the rotating part of the centrifugal pump. It consists of a series of backward curved vanes. 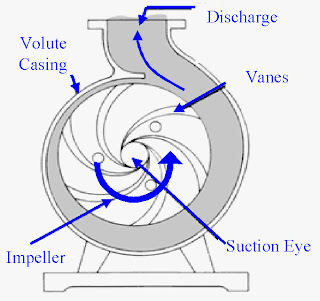 Impeller is connected to a shaft which is connected to an electric motor. Vanes are backward curved blades connected to the impeller. It guides the water from the eye of impeller to the casing. It is an airtight passage surrounding the impeller. It is designed in such a way that water discharged at outlet of the impeller is converted into pressure energy. From the impeller the water moves to the delivery pipe. It is a spiral type of casing in which area increases gradually. Increase in area decreases the velocity of flow. The decrease in velocity increases the pressure of water flowing through the casing. 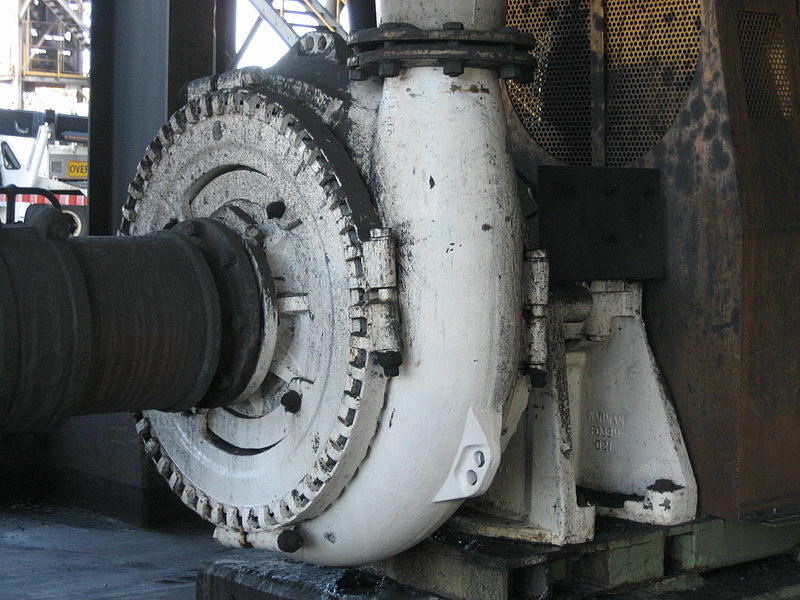 The main disadvantage of volute casing is that, the efficiency of pump decreases as large amount of energy is lost due to the formation of eddies in the casing. 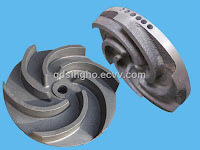 In whirlpool casing, a circular chamber is introduced between the casing and impeller. This circular chamber considerably reduces the formation of eddies and thus reduces the loss of energy. Thus the efficiency of pump is increased. It is a pipe which is connected to inlet of pump whose other end is dipped into water in the sump. At the bottom end a foot valve and a strainer is fitted. The foot valve is a non-return valve, ie it allows water to flow only in upward direction, which automatically closes when water flows backwards. The strainer prevents solid materials in water from entering the suction pipe. Pipe whose one end is connected to outlet of pump and other end delivers water at a required height. The delivery pipe collects the high pressure water coming out of the casing. Priming is the operation in which the suction pipe, casing of the pump and a portion of the delivery pipe is completely filled up from outside source with the liquid (usually water) to be raised by the pump before starting the pump. Thus from these parts the air is removed and is completely filled by the liquid. When the pump is running in air, the head generated is much less compared to head generated when the pump is filled with water. In such case, water may not be sucked from the pump. The pump will be just rotating without rising the water to the required level. To avoid this priming is done. Cavitation is the phenomenon of formation of vapour bubbles of flowing liquid in the region where the pressure of the liquid falls below the vapour pressure, and the sudden collapsing of the these vapour bubbles in a region of higher pressure. When the bubble collapse a high pressure is generated. The metallic surface, above which these vapour bubbles collapse, is subjected to high pressure and can cause pitting action on the surface. Thus cavities are formed on the metallic surface and also considerable noise and vibrations are produced. Tahnkfully i can know the parts of the centrifugal pumps. And i have an interest in doing the pump related activities. Thanks for sharing this post. I just buy a electric pumps And the work very good.